Banweer, J., Pathaka, A., Pandey, S. (2012). Development and Optimization of Transdermal System of Lisinopril dehydrate: Employing Permeation Enhancers. Iranian Journal of Pharmaceutical Sciences, 8(4), 245-251. Jitendra Banweer; A. K. Pathaka; Subhash Pandey. "Development and Optimization of Transdermal System of Lisinopril dehydrate: Employing Permeation Enhancers". 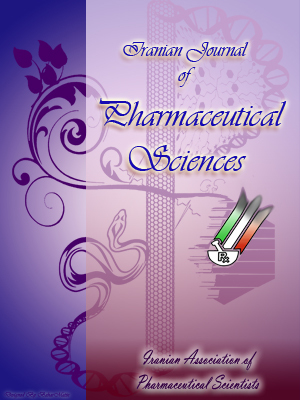 Iranian Journal of Pharmaceutical Sciences, 8, 4, 2012, 245-251. Banweer, J., Pathaka, A., Pandey, S. (2012). 'Development and Optimization of Transdermal System of Lisinopril dehydrate: Employing Permeation Enhancers', Iranian Journal of Pharmaceutical Sciences, 8(4), pp. 245-251. Banweer, J., Pathaka, A., Pandey, S. Development and Optimization of Transdermal System of Lisinopril dehydrate: Employing Permeation Enhancers. Iranian Journal of Pharmaceutical Sciences, 2012; 8(4): 245-251. 2Department of Pharmacy, Barkatullah University, NH-12Bhopal-462026. 3Glenmark Pharmaceuticals Ltd. Andheri (E), Mumbai-400026. Lisinopril dihydrate (angiotensin converting enzyme inhibitor) is a lysine derivative of enalaprilat and does not require hydrolysis to exert pharmacological activity. It has an extensive hepatic first pass metabolism resulting in a bioavailabil-ity of 6-60%. To overcome the poor bioavailability of the drug, transdermal patches have been prepared. The present study also aims at optimization of the formulation by incorporating the penetration enhancers in different concentration and ratios. The patches were prepared employing hydroxy propyl methyl cellulose (HPMC) and polyvinyl alcohol (PVA) in a 1:1 ratio as polymeric matrix using glycerol as plasticizer in 6% concentration. Binary solvent system (water-methanol) in a ratio of 70:30 was taken for the study. The transdermal devices were fabricated on glass substrate using solvent casting technique. Dimethylsulfoxide (DMSO) and propylene glycol (PG) were added as the penetration enhancers individually and in blends in different concentrations and ratios. Various physico-chemical evaluation parameters were carried over prepared patches to ascertain their integrity and physical stability at normal and accelerated temperature conditions. Optimization of the penetration enhancer’s concentration and ratio was done by performing in vitro diffusion rate studies using Keshary- Chein diffusion cell on Goatskin. The patch containing DMSO:PG in the ratio of 70:30, at 10% showed the best in vitro drug flux and possesses excellent physico-chemical properties at normal and accelerated temperature conditions. It could be concluded that all patches prepared increased the drug flux through skin but optimization of the formulation yields highest drug flux through patch containing DMSO and PG in 10 % concentration. Most of the chronic diseases have genetic, hereditary cause or lifestyle borne like hypertension, asthma, diabetes, addiction etc. It is desirable, from the standpoint of pharma-codynamics to maintain the drug concentration in plasma within a therapeutic effective range for long periods . However, even if the drug is well absorbed orally, it will run through entero- hepatic cycle. In some cases it will decrease the systemic availability of drug as it undergoes hepatic first pass metabolism. This effect will establish a significant difference between claimed (theoretical) and attained (practical) bioavail-ability of drug moiety . To compensate the loss, massive dosing will make the product bulkier, process uneconomical and may cause toxicity in some cases. Among conventional dosage forms, continuous i.v. infusion is the sole exception that will bypass the hepatic cycle and also releases the drug following zero order kinetics for long term, hence minimizes overdosing [3, 4]. Therefore, attention has been given to develop transdermal drug delivery system with the large surface area of skin as the site of application. The drug selected for present work is Lisinopril dihydrate, a lysine derivative of enalaprilat. The drug is used against chronic conditions like hypertension, diabetes nephropathy, and cardiac heart failure (CHF). Although half-life of the drug is 12 h, thus effective as single daily dose medication, but it severely suffers from average inter-subject bioavailabilty of 25% [5, 6]. Hence, transdermal delivery could be an alternative approach that will increase the bioavailabil-ity of drug and sustained the drug release for long periods. In order to overcome the barrier properties of skin, DMSO:PG combinations as penetration enhancers are employed in the formulation. Lisinopril dihydrate was a gift sample from Lupin Laboratories Ltd. Mandideep, Bhopal. DMSO, PG, HPMC and PVA were procured from CDH Fine Chemicals, Gwalior. Methanol and glycerol were purchased from S.D. Fine Chemicals. VI-JOHN depilatory cream was used. All other chemicals and reagents involved in the study were of analytical grade. The locally purchased goatskin belongs to Jamna Pari species. The hydroxy propyl methylcellulose (HPMC) and polyvinyl alcohol (PVA) were chosen for fabricating polymeric matrix into which drug has to be dispersed [7-9]. The best ratio was found to be 50:50 of HPMC and PVA. Glycerol was added as plasticizer to the formulation. It was found to be 6% with respect to the final volume of the solution (20 ml). To 10 ml of the solvent system (water:methanol; 70: 30) was added and then the beaker was kept on magnetic stirrer at 500 rpm with the Teflon coated magnetic bead to dissolve the content. Ethanol was used as the co-solvent with water, which has demonstrated to increase penetration of variety of drugs through the skin barrier. As a result, a positive influence on the percutaneous delivery of drugs from topical dosage forms to facilitate the desired penetration rate of drug. At this stage of formulation the permeation enhancers selected were added individually or in blend into the mixture. Then Lisinopril dihydrate (39 mg), as decided to distribute 1 mg/cm2 throughout the surface area of the patch was added in the mixture and finally the volume was made up with the help of solvent system to 20 ml.The mixture was kept under constant stirring to obtain the homogenous and uniform solution of the formulation. Precautions were taken to prevent evaporation of the volatile components and formation of air bubbles. After uniform solution was obtained it was poured on a glass casting plate kept over a uniform horizontal surface to obtain uniformly thick film of 0.2 mm. The patches were dried at normal room temperature conditions of 30±3ºC for the period of 2-3 days (Table 1). The weight, thickness and physical consistency of the films were observed immediately after formulation. On achieving the desired characteristics of the film, the same was also subjected for storage for one month at normal room temperature conditions. This was done to determine the effect of storage conditions on the physical nature of the prepared films. Tensile strength was measured in kg/cm2 by enacting the weight onto the specified area of film till it breaks. This was done to find out the flexibility/ elasticity of the patch/film may be encountered at the time of transportation and storage. This test was carried out at CIPET (Central Institute of Plastic Engineering and Technology), a central government undertaking institute (Table 2). The folding endurance (FE) would be defined as the number of folds required to break any polymeric film . The folds on the patch/film have to be made at the same point, till it breaks. It was measured manually by cutting a strip of patch of uniform size (4 x 3 cm) and repeatedly folded at the same place till it broke. The number of folds a film/patch can sustain will dictate its Folding endurance (Table 2). It would be defined as the ratio of the length of film/patch in normal position to stress condition . Here, stress conditions would be stated as stretching the film/patch to the point till it breaks down and measuring the largest length of the intact patch before breaking. This was also performed at CIPET (Central Institute of Plastic Engineering and Technology), a central government undertaking institute (Table 2). chloride. The vial was taken out periodically and weighed for a period of 72 h. The experiment was performed in triplicate and the average values were reported (Table 2). The moisture absorption studies of various films were carried out at 63% relative humidity. The film of known thickness was fixed over the edge of the glass vial containing 3 gm of fused calcium chloride as desiccant by using an adhesive. Then the vial was weighed and placed in a desiccators maintained at the 63% and relative humidity. The vial was taken out periodically and weighed for a period of 72 h. The experiment was performed in triplicate and the average values were reported (Table 2). The film of known thickness was fixed over the edge of the glass vial using an adhesive. Then the vial was weighed and kept in desiccators containing 10 gm of calcium chloride as desiccant. The vial was taken out periodically and weighed for a period of 72 h and the values were calculated and reported (Table 2). The films were stored at different temperature conditions of 4, 25 and 40 ºC to ascertain the effect of extreme temperature variation on the physical consistency and drug content of the transdermal patch. Thereafter, all the physicochemical tests were performed over them. The drug content studies were also carried over the stored transdermal films (Table 3). After removal of epidermal hair from abdominal surface with scissor and depilatory cream, the adhesive fatty layer was carefully stripped off with scalpel. Then the skin was thoroughly washed with phosphate buffer saline and left overnight in PBS to recover from ill effects of depilatory cream, if found any. Prior to permeation studies the skin was equilibrated with receptor phase [15-21]. The transdermal films measuring 3x3 cm2 area were placed over the skin in intimate contact with stratum corneum. A sheet of aluminum foil was kept onto the surface of transdermal film, which acts as the backing membrane and as well as fix the film properly with the skin. The receptor compartment was filled up with the solvent system (elution medium), to 30 ml, which was the ratio of distilled water:methanol (70:30) and was checked for any air-bubble present. The diffusion area available was 3.14 cm2 (circular), and the cell was then kept on the magnetic stirrer at 37 ºC for constant stirring throughout the study with the maintenance of sink conditions. Aliquots from the receptor compartment of 1 ml were withdrawn periodically up to 24 h and after suitable dilution were analyzed spec-trophotometrically at 560 nm against blank reagent within stability period of 60 min. . Each formulation was carried out in triplicate. The cumulative amount of drug released /cm2 was then plotted against time1/2 and the slope of the linear portion of the plot was estimated as steady state flux (mg/cm2/h) (Table 4). - Among formulations containing DMSO individually, Patch No. B2 containing 10% of enhancer yields highest in vitro drug release through an excised goatskin of 53.83 % as cumulative percent release (C.P.R.). - Among formulations containing PG individually, Patch No. B5 containing 10% of enhancer yields highest in vitro drug release through an excised goatskin of 61.03 % as cumulative percent release (C.P.R.). - Among formulations containing a blend of DMSO:PG in the ratio of 70:30, Patch No. B8 containing 10% of enhancer yields highest in vitro drug release through an excised goatskin of 61.66 % as cumulative percent release (C.P.R.). - Among formulations containing a blend of DMSO:PG in the ratio of 30:70, Patch No. B10 containing 5% of enhancer yields highest in vitro drug release through an excised goatskin of 61.00 % as cumulative percent release (C.P.R.). - Among formulations containing a blend of DMSO:PG in the ratio of 50:50, Patch No. B14 containing 10% of enhancer yields highest in vitro drug release through an excised goatskin of 61.16 % as cumulative percent release (C.P.R.). The in vitro release of the drug through polymeric patches/film shows formulation variation, may be due to: (1) inherent properties of the permeation enhancers such as surface tension, viscosity, volatility etc. ; (2) formulation variables involved in the study like make-up volume of solvent, solubility and compatibility of various components; (3) other additional inherent properties of enhancers like humectants, plasticizer and co-solvent. The above-mentioned results clearly showed difference in the optimized concentration of DMSO and PG. Patches containing DMSO and PG showed optimized concentration of 10% for the best drug flux through excised goatskin. In individual study, DMSO proved to be better candidate in drug permeability enhancing ability through goatskin than PG, as evident in 10% concentration i.e, B2 and B5. But when they applied in combination containing higher proportion of DMSO, i.e., DMSO:PG (70:30), patch showed best in vitro drug release rate but that too in the optimized concentration of 10%. As the concentration of blend increases to 15% the drug release rate declines which clearly indicates the optimization factor of concentration to act thereon (Tables 1-4). The PG being basically the additive like smoothening agent and plasticizer maintaining the integrity of the patch, providing physical stability to the patch in optimized concentration and when combined with DMSO in higher proportion produces best in vitro drug release profile. Therefore, although the permeation rate (flux) of drug has been improved through excised skin after employing penetration enhancers, even then the results suggest an optimized concentration of the enhancer for the formulation. The results also indicate that structures of lipid bilayers in the stratum corneum were slightly disrupted by treatment with ethanol and water in the 30:70 v/v ratios. The increase in the permeability of drug may also be due to this effect. The binary solvent system might be effective as a vehicle to enhance the skin permeation by co-solvency factor. The drug release from the patches follows Higuchi’s kinetics and gives a linear relation between q (amount released) vs t1/2 (time). The cumulative amount of Lisinopril released and permeated per unit area (mg/cm2) were plotted against time (h), and slope of the linear portion of the plot was estimated as steady state flux ((mg/cm2/h). At last, it is clearly, evident from the results obtained that incorporation of the penetration enhancers had increased the drug flux through skin. The study also noticed the impact of solvent system over the drug permeation through bilayers of epidermis. All the patches were physico-chemically stable at normal and accelerated temperature conditions. The study has witnessed the optimization factor of permeation enhancers in terms of concentration and ratio, based on this further commercially viable formulation of the drug could be done. I sincerely thank Lupin Laboratories for providing me free gift sample of drug. I am also grateful to CIPET, Bhopal for providing me facilities to carry out experimental part at their premises. Last not least I pay my gratitude to Department of Pharmacy, Barkatullah University, Bhopal. Govil SK. Transdermal drug delivery systems. Drug Delivery Devices By Praveen Tyle, 1987: 386 - 417. Yie CW. Novel drug delivery systems. Marcel and Dekker Inc., New York, 1987; pp. 2-3, 149-153, 185-193. Yie CW. Transdermal controlled systemic medications. Marcel and Dekker Inc., New York, 1982; p. 125. Rougier A, Lotte C, Maibach HI, The hairless rat: a relevant animal model to predict in vivo percutaneous absorption in humans. J Invest Dermatol 1987, 88: 577-81. Itoh Y, Imamura S, Yamamoto K, Ono Y, Nagata M, Kobayashi T, Kato T, Tomita M, A, Itoh M and Nagasaka A. Changes of endothelin in streptozotocin induced diabetic rats: effects of an angiotensin converting enzyme inhibitor enalapril maleate. J Endocrinol , 2002, 175: 233-9. Patchett AA. In: Hypertension and the angiotensin system: therapeutic approaches; Raven Press, New York, 1984; pp. 2-13. Wongpayapkul L, Lessawat P, Rittirod T, Klangtracul K, Pongpaibul Y. Effect of single and combined permeation enhancers on the skin permeation of ketoprofen transdermal drug deliverey system. CMU. J 2006; 5: 41-51. Herbig JA, Hanny JF et al.. Low density micropheres and their use as contrast agent for computed tomography. U. S. Patent 3,732,172, 1973. Matsukana H. Preparation of multiwall polymeric microcapsules. U.S. Patent 3,523,906, 1972. Tanwar Y.S. Formulation and evaluation of transdermal films of salbutamol sulphate. J Pharm Sci. 2005; 4: 93-7. Khurana R, Ahuja A, Khar RK. Development and evaluation of mucoadhesive films of miconazole nitrate. Ind J Pharm Sci 2000, 62: 447-53. Allen DJ, Demarco JD, Kwana KC. Free films 1: apparatus and preliminary evaluation. J Pharm Sci 1972, 61: 106-10. Yates, Daniel, Moore, David, McCabe, et.al,, The Practice of Statistics., W. H. Freeman & Co., New York., 1999. G. L. Carroll, R. N. Hooper, D. M. Boothe, S. M.Hartsfield, L. A. Randoll, et.al, Physiological and behavioral effects of opiods in pigs subjected to abdominal surgery.,Amer. J. Vet. Res., 1999, 57: 986-991. R. D. Mosha, P. Neilsen, et.al, Fate of ethion in goats after intravenous, oral and dermal administration., Pharmacol. Toxicol., 1990, 3: 246-251. R. Puchala, et.al, Effects of prolactin administered to a perfused area of the skin of Angora goats., J. Anim. Sci., 2003, 1: 279-284. C. Krzysztof, J. Stanislaw, S. Malgorzata, In-vitro studies on penetration of terpenes from matrix type transdermal systems through human skin., Int. J. pharmaceutics., 2001, 224, 81-88. M. A. Yamane, A. C. Williams, B. W. Barry, Terpene penetration in Propylene glycol/Water co-solvent systems: Effectiveness and mechanism of action., J. Pharm. Pharmcol., 1995, 47, 978-989. G. K. Jain, A. K. Sharma, S. S. Agrawal, Transderaml controlled administration of verapamil enhancement of ski permeability., Int. J. Pharmaceutics., 1996, 130, 169-177. M. S. Olivella, N. B. Debattista, N. B. Pappano, Salicylic acid permeation: A comparative study with different vehicles and membranes., Biocell, 2006, 30,321-324. A. P. Devi,, M. Rao, K. M. M. Prasad and S. P. Sastry, Four simple spectrophotometric determinations of Lisinopril in pure state and in Tablets., Ind. J. Pharm. Sci., 2003, 296-299.